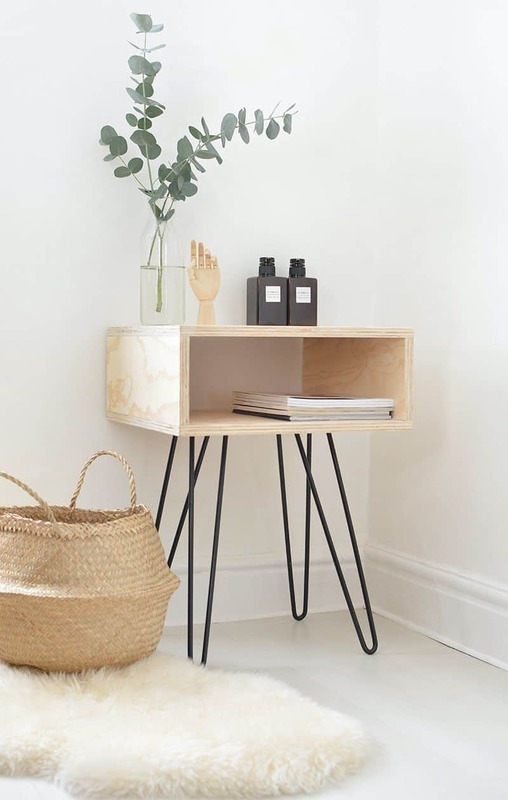 Apart from seeing its function, the side table has a big role in your room. 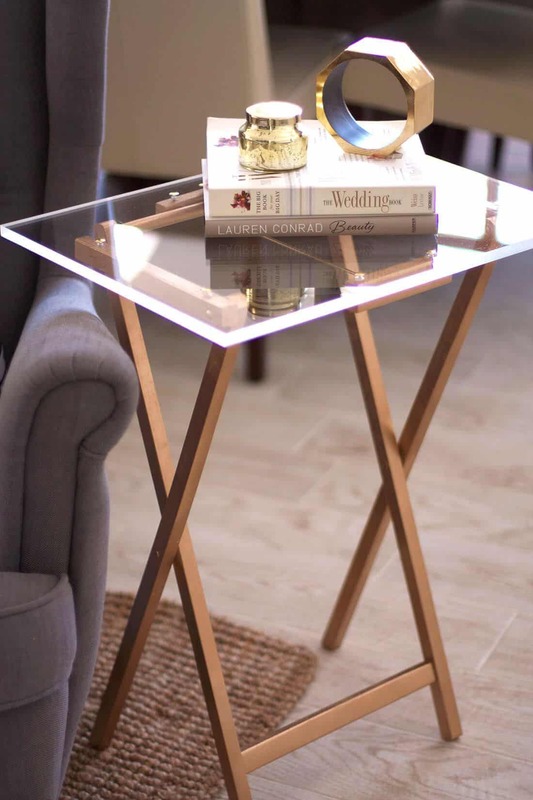 Other than that, the uniqueness of a side table can be a center of interest to your home. Also, you can use the furniture to accentuate your bedroom or living room. 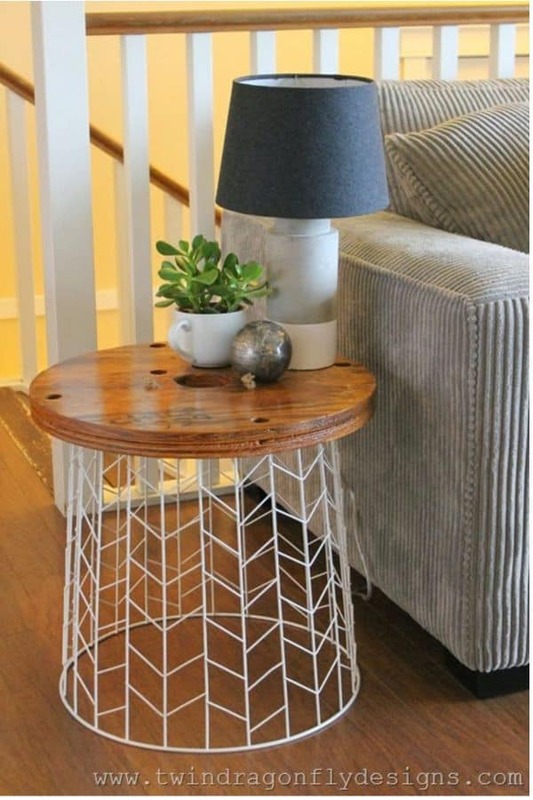 Here are some inspiring DIY side table ideas to improve your home ambience. Need something iconic but simple for your room? 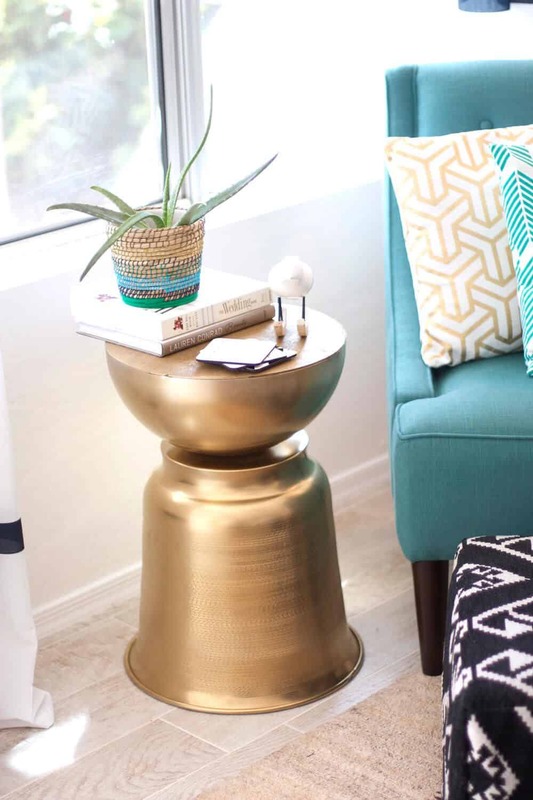 This DIY side table will bring a unique accent to your home. All you need is to attach a vinyl record on top of the metal plant stand. Use a hot glue gun to tape them together. Done! 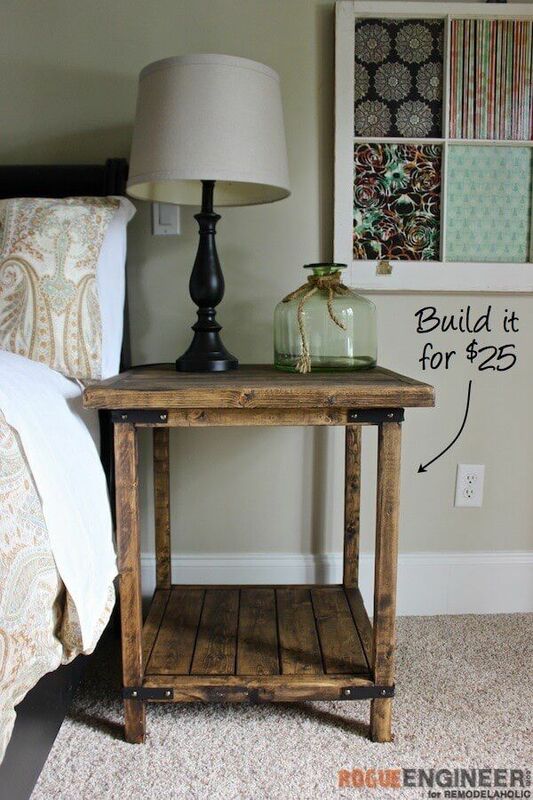 This DIY side table is easily done. You only need a wooden stump. Then, polish it so that the color looks shiny. It’s optional, but you can use gold spray paint to strengthen the color. Finished in less than 10 minutes! 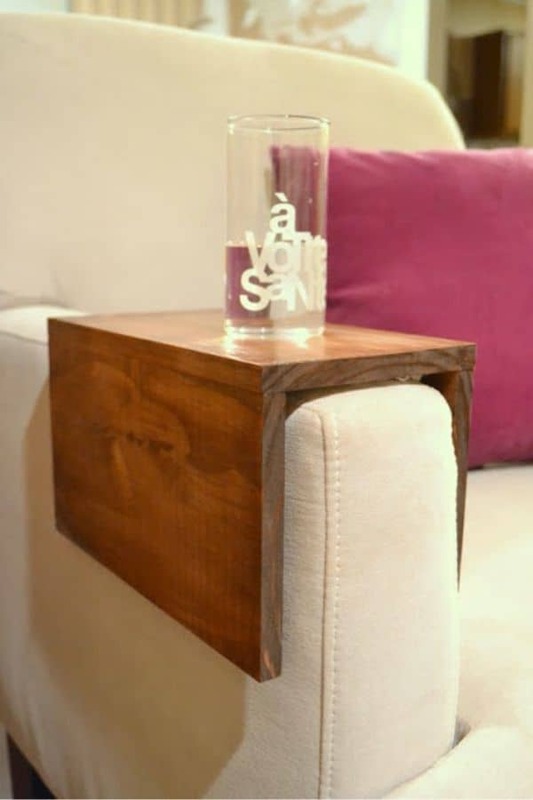 A wooden couch sleeve can be the best choice for a minimalist design. Simply put it on the sofa arm, and the home ambience will change. It’s also very functional. While watching TV or chatting with friends, you can put a glass container or drink bottle up there. If you’re a minimalist enthusiast, that is you. 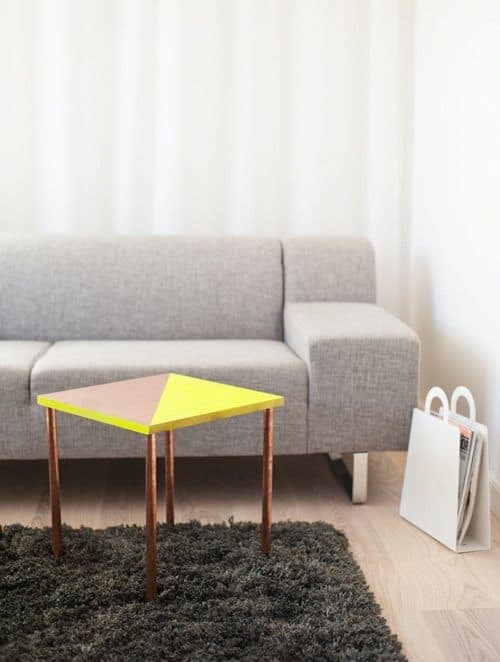 This DIY side table requires an IKEA classic self and some wooden legs. 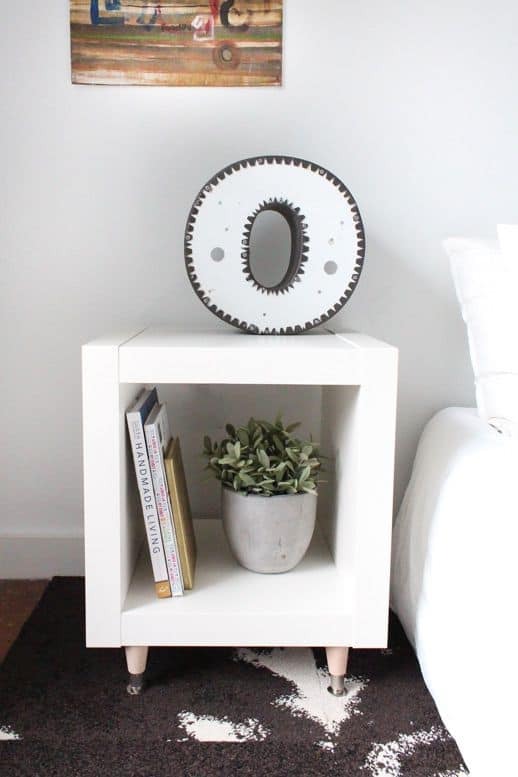 Bring the two together with drill bits and a charming side table ready to adorn your home. 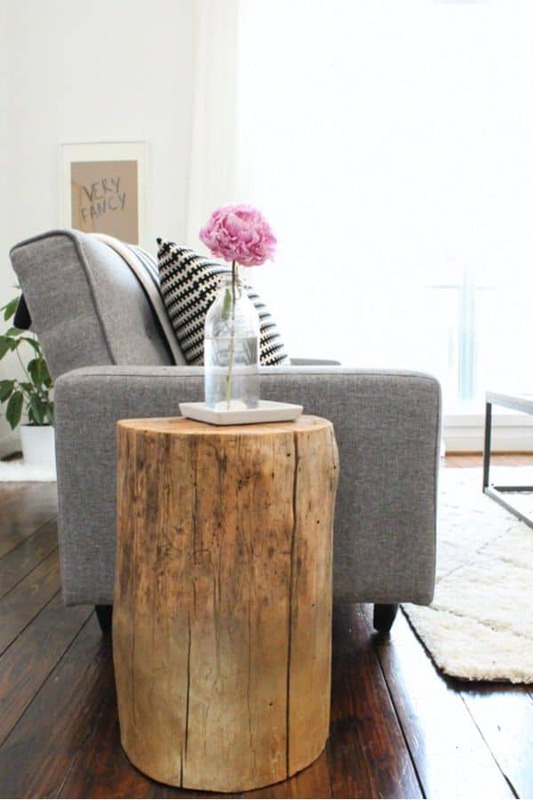 A tree stump side table is simple yet elegant. But, you can decorate it with shiny studs. Sure, it will give a cute contrasting look. Tired with rustic colors? A white touch is a great choice for different displays. Want a futuristic touch on your room? 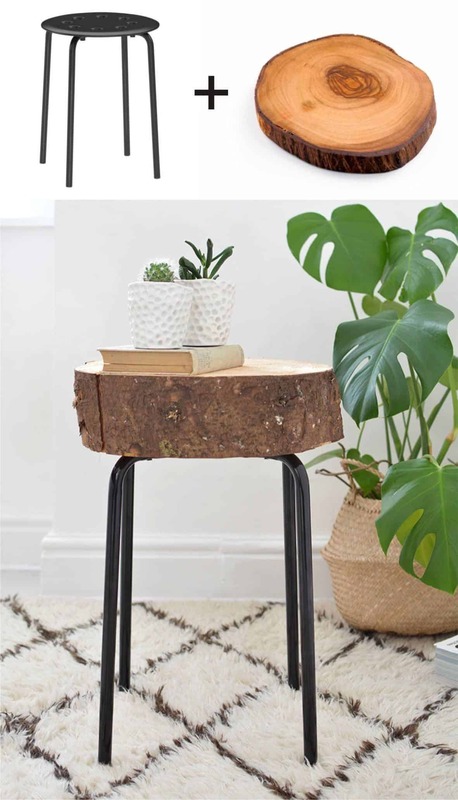 This DIY side table will give you that. 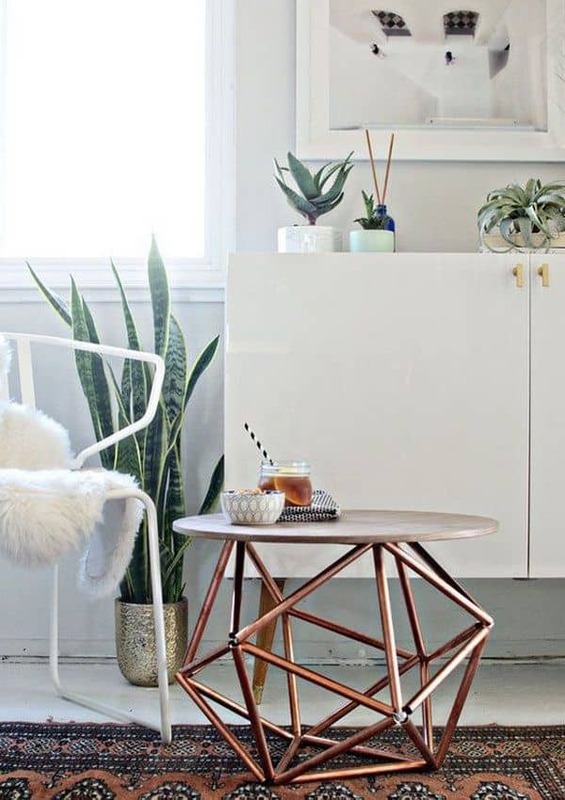 Use the twine to connect the copper pipes and form a table frame. At the top, place a plywood veneer that has been cut in a round shape. Lastly, varnish it to get a radiant look. If rustic is your religion, this bedside table is a must-have for you. Sure, it will bring a natural impression into your room. 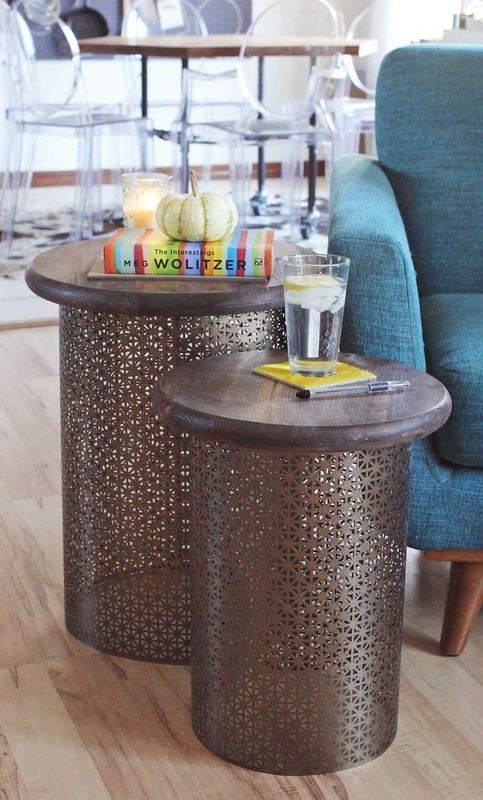 Plus, there are added decorative studs at the top corner and table legs. 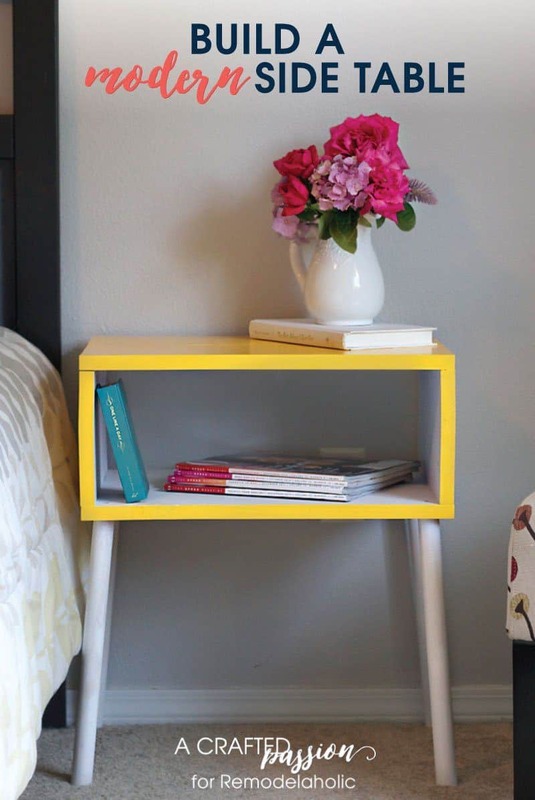 This DIY side table can be the main focus of your room. Super chic and showy, the table is made of an old door. Just give it wooden legs and paint it with vivid colors. The combination of yellow and gold gives an attractive contrast. 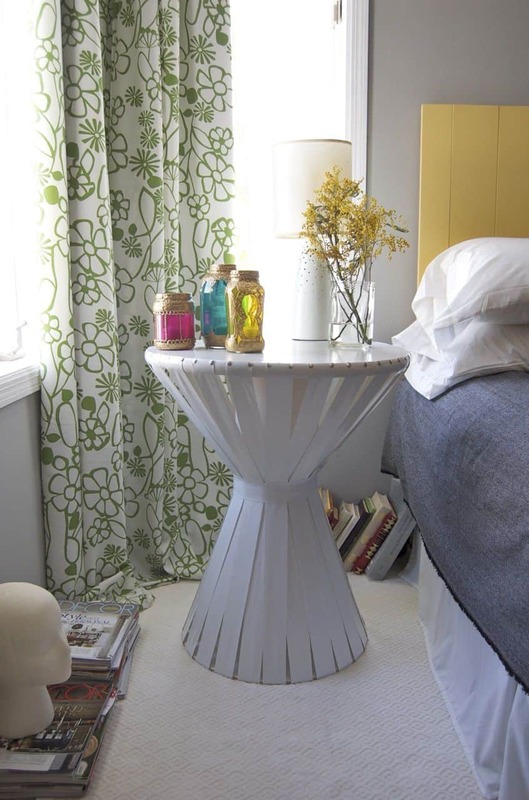 Have you ever thought, your side table is too plain and requires a touch of art? This idea can be an alternative for you. You can give vinyl cloth decorations that are connected from top to bottom. Yes, that’s all and everything changes! Simple doesn’t always have to be plain. 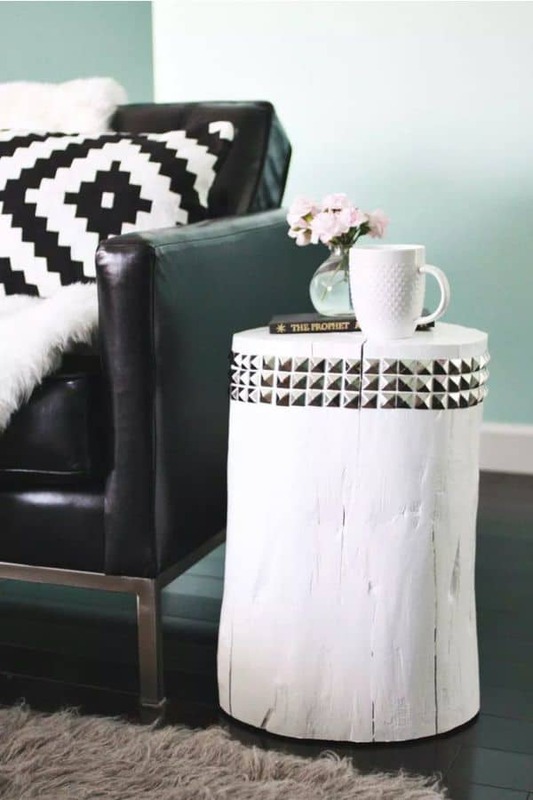 You can bring modern touch into the room with this cool DIY side table. Use veneer plywood for the top and wooden dowel for the table legs. Finish it with yellow and white paint for a fresh look. This hack only needs 2 steps. Polish the IKEA planter, wood disc, and serving bowl with gold spray paint. After that, glue the wood disc on the top of the serving bowl. Lastly, stick the bottom of the bowl and planter with a hot glue gun. Everything has been set! 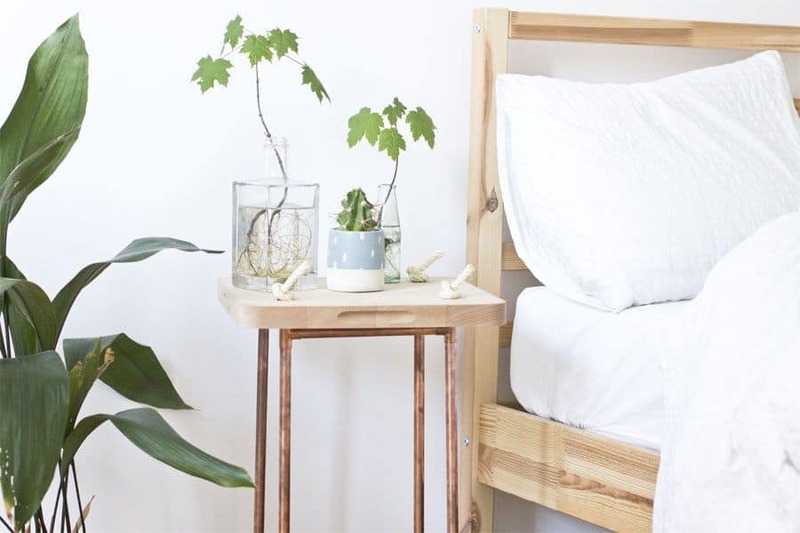 It is one of the DIY side tables that don’t require much effort to make it. Just take off the top of your TV tray table. Replace it with acrylic glass. Then polish the table legs with gold spray paint. The mid-century furniture always gives an iconic touch to the room. 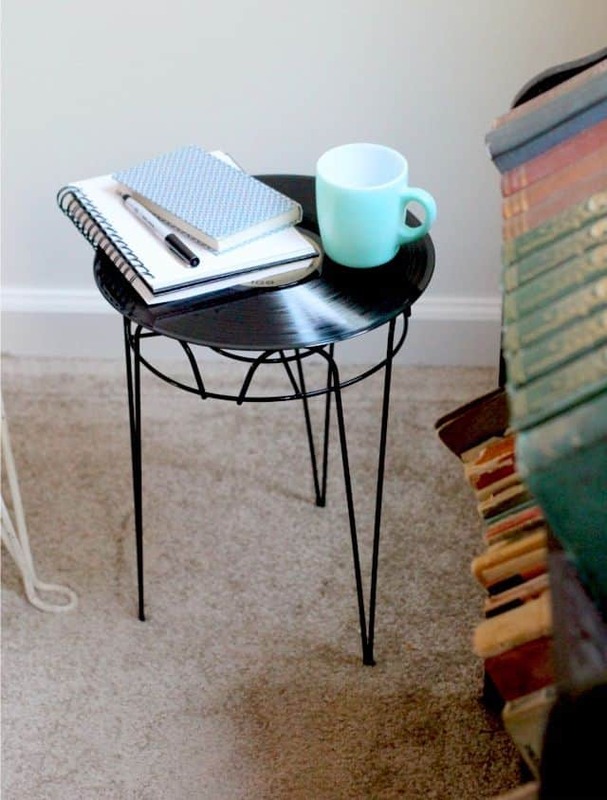 So, bring that mood to the home by making your own side table. First, make a simple self from plywood. Then patch it with the hairpin legs. This simple hack requires Ikea round chair and a wood log slice. With that, let’s create an iconic table. Bring the two together with the help of a hot glue gun. Done! Put it in the living room or bedroom to build a soothing mood. 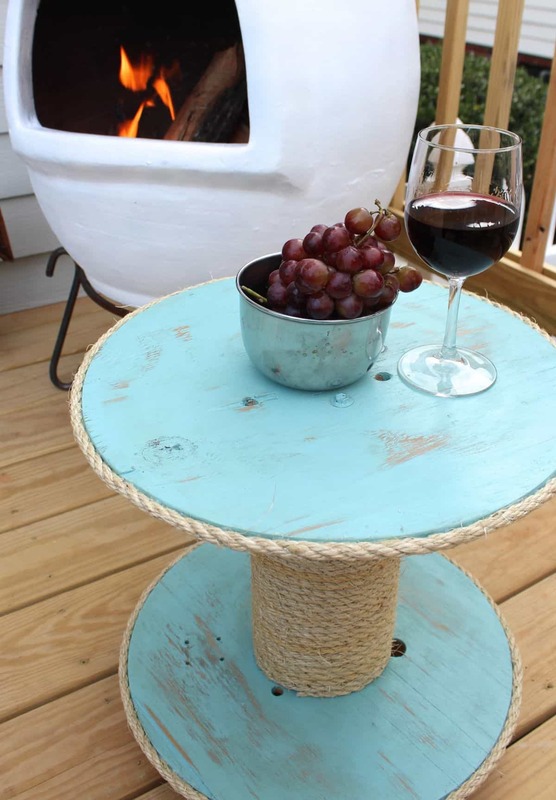 This DIY side table will bring the sea ambience into your space. The rope details also give a chic accent. Other than that, the distressed look of this blue-sky-coloured table looks rustic. This do-it-yourself project gives a modern touch to the home. The inside of the table can also be used as a place to put stuff like coins, magazines, or other things. 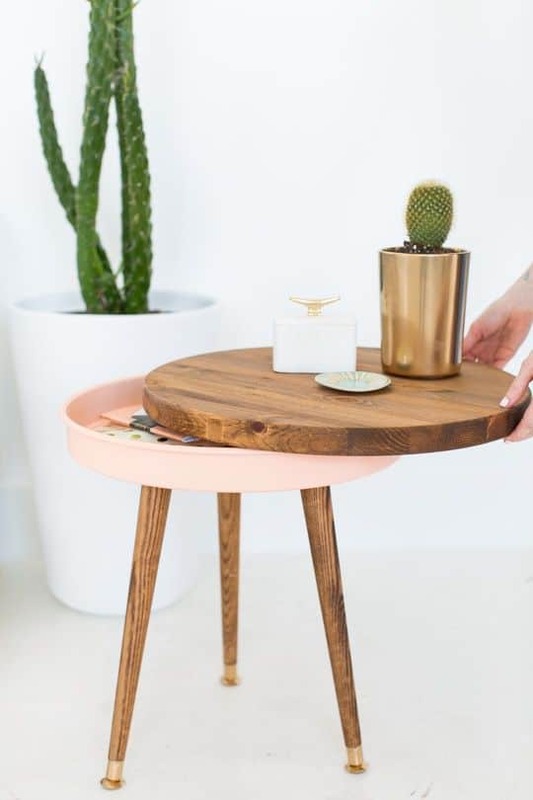 Besides, the combination of natural wood color and soft pink makes everything perfect. Do you like a piece of furniture with unique cuts? This side table offers twisty cuts, but it still looks sturdy. 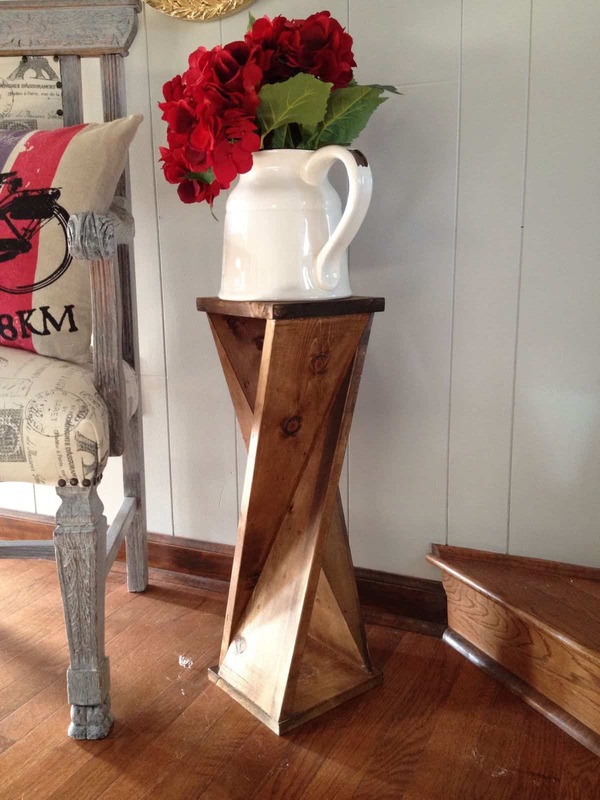 That is perfect for improving your rustic home. Because the table size is not large, simply use it as vase planter. This cute table requires carpentry skills to make it. But believe me, the results will be amazing. Also, the color of aqua crystal brings a nice nautical theme into the room. Don’t limit your creativity! This side table is iconic and simple. You simply need to stick a wood disc on top of a metal umbrella basket. To give radiance to the wood, you can add Danish oil wood finishes. Well, it doesn’t require skill. It will bring a luxurious impression to the home. First of all, use the decorative aluminium sheet to make a tube. Then, install a wood round above it. Lastly, polish it with glossy brown spray paint. But, it’s better if you make different size tables to improve the character of your room. Only you can stop your imagination! 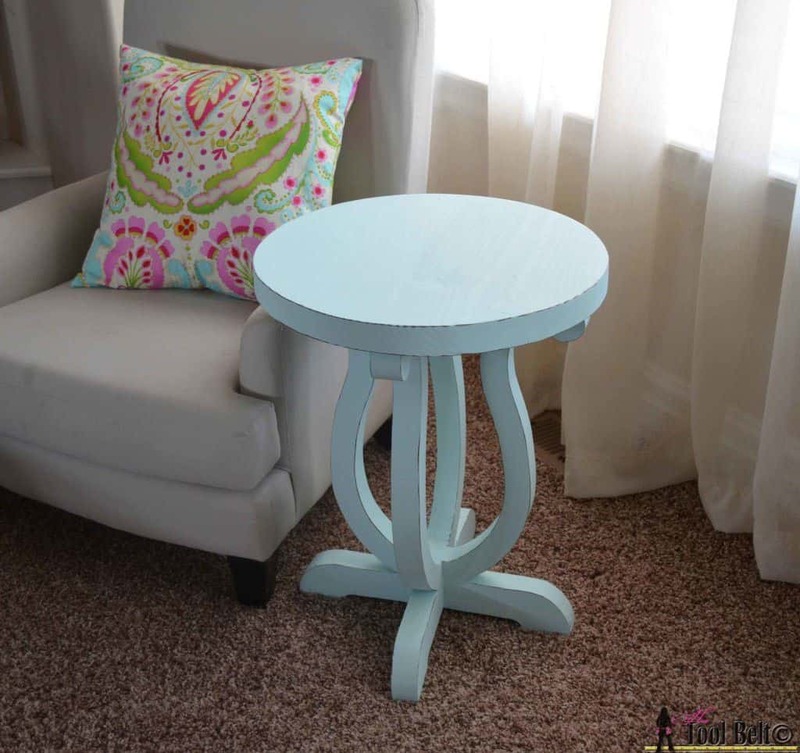 So, let’s try these amazing DIY side table ideas to improve the home atmosphere.